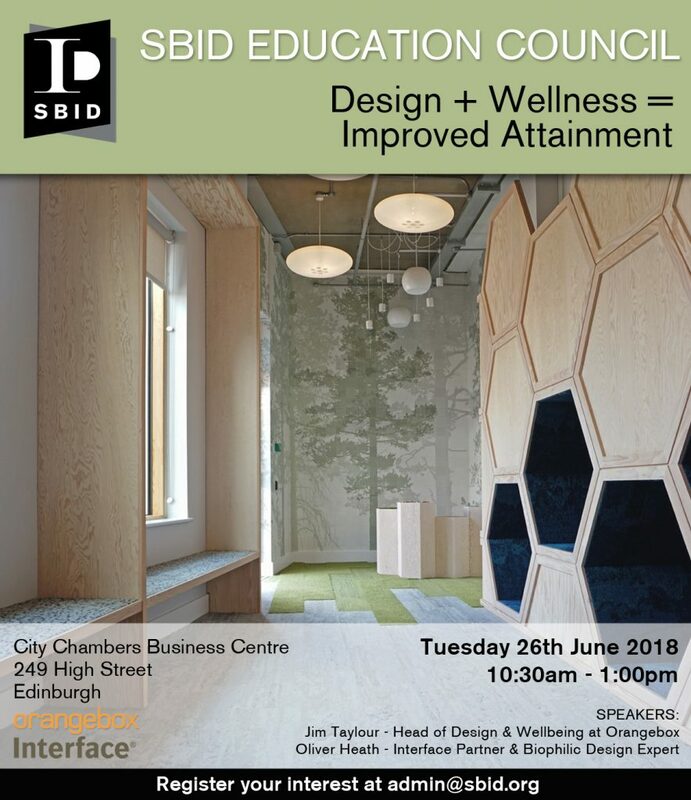 The SBID Education Council is hosting an event on the Tuesday 26th June to discuss how improving wellness in learning environments can improve attainment. Sponsored by Interface and Orangebox, The event is open to interior designers and architects, but teachers and educational decision makers are also welcome to attend. Two talks will be held at 11.00am and 12.10pm by Jim Taylor, Head of Design and Wellbeing at Orangebox and Oliver Heath, Interface Partner and Biophilic Design Expert. Jim trained as a furniture designer and ergonomist, working in the furniture industry for 30 years both in a specialised occupational health capacity and in mainstream workplace design and research. He heads up Design at the Orangebox UK based manufacturing centre in South Wales and also chairs the Institute of Ergonomics and Human Factors special interest group on children’s ergonomics to represent the industry furniture standards across Europe through the British Standards Institute. His recent publications include ‘Mobile Generations’ exploring Agile Smartworking and the emerging health and productivity challenges affecting the workplace. As a result of the findings an initiative developed by Jim is ‘wireless well working’, a workplace strategic design tool to help organisations shape their environments to support their own wellbeing and collaborative initiatives. Jim will talk to us about his recommendations and basic rules for selecting furniture for classroom environments to improve the quality of interior design in education. Oliver is a qualified Domestic Energy and Green Deal Assessor who founded an architectural and interior design practice, combining sustainability, consumer engagement and communications to inspire the uptake of future thinking in the built environment. Biophilia (meaning love of nature) focuses on human’s innate attraction to nature and natural processes. It suggests that we all have a genetic connection to the natural world built up through hundreds of thousands of years of living in agrarian settings. Biophilic Design uses these ideas as principles to create a human centred approach that when applied improves many of the spaces that we live and work in today, with numerous benefits to our health and well-being. Our built environment features a huge range of educational buildings, of all different scales and capacities: from small nurseries through to vast schools and university campuses – many of which resemble self-contained villages. However, what these buildings all have in common is that staff members and students inhabit them on a daily basis in order to teach and learn. Research has proven that our attention capacity (essential for our cognitive functioning) is restored when we come into contact with nature. Studies have demonstrated that Biophilic educational spaces have the ability to improve performance and the well-being of both staff members and students.